There is a general, ambient light all around, with a suggestion of light coming from the right, casting shadows to the left. 01) (This page) Proverbs 18v10 – Strong tower (Version 01). 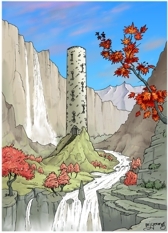 In this version the sky is blue and the land the tower is on has a green hue. Colour contrast between sky, landscape and trees is more striking in this version. 02) (Next page) Proverbs 18v10 – Strong tower (Version 02). 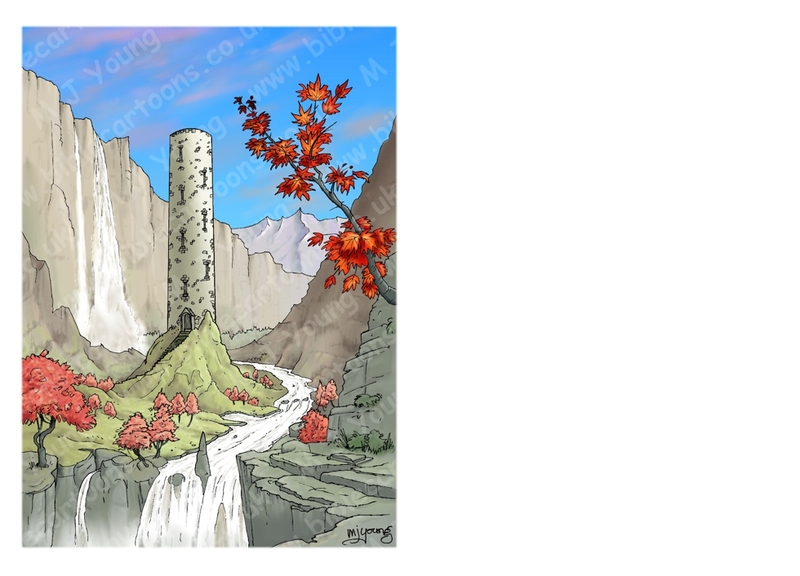 In this version the sky is red and the land the tower is on has a red-brown hue, similar to the foreground rocks. The tower is also redder in hue than in version 01. I was trying for a much more autumnal colour scheme in this version. This scene was designed for a greeting card I have in mind. In version 01 I was aiming for a rich red autumn colour rendering in the Acer trees in the picture, which contrast strongly with the greys, greens and browns in the foreground and mid ground elements. The distant mountains have pale violet tones indicating aerial perspective (distance). Version 02 of this scene brings more orange browns into the foreground and mid ground landscape, coupled with the yellows and reds in the sky, all of which has the effect of harmonising the design and reducing colour contrast in the scene. I was aiming for an autumn feeling to the whole picture.